While the writing in this little book is nothing extraordinary, the story is. 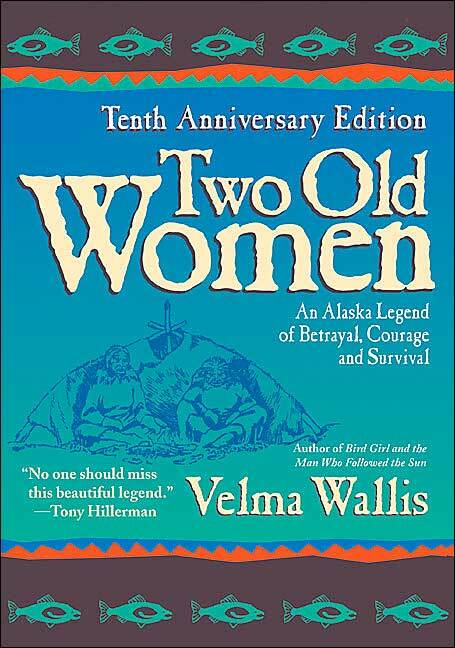 Two elderly women have been abandoned by their tribe during a terrible winter famine in Alaska. At first, they wonder how they will survive given their limited physical capabilities and wounded emotions. However, they bravely struggle through each day gathering just enough wood, and just enough rabbit, to make it back to the original camp their people had left. Through sheer determination, the women discover that they are not as feeble as The People had assumed. Not only do they survive, they must create caches for the abundance of dried fish and meat they have caught. When the tribe returns disheartened, hungry and tired, they are astonished to find these two women living so well. It is agreed that they will never be abandoned again, and most importantly, the women have gained respect not only from their families but from the hunters. In a culture such as ours today, which I find places very little value on the elderly, I am encouraged to read the story of such strength and wisdom. I think it’s important to realize how we can benefit one another, and how valuable each person is regardless of age. As he spoke, Daagoo realized that in these two women, whom he once thought of as helpless and weak, he had rediscovered the inner strength that had deserted him the winter before. Now, somehow, he knew that he never would believe himself to be old and weak again. Never! What a great message! Kudos to the author for writing it–and to you for spreading the word. Thanks! I loved this book when I read it a few years ago. Am I remembering correctly that the two old women were terrible complainers in the beginning? It was a wonderful story. I brought this home from the library last year and it was due back before I read it. Looks like I made a mistake by not renewing! This sounds like the sort of thing I'd love. I've never heard of it before, so thanks for bringing it to my attention. I loved this book so much that I ordered Velma Wallis' other two books. I haven't read the other folk tale, yet, but I read her autobiography. It wasn't the best writing, but it was certainly fascinating. this sounds like a great story….I think I will head to the library tomorrow! I read my whole "to read" stack while sick in AZ so I need something new! Power to the old women! I don't consider myself old yet, but I'm headed there…and when I arrive, I will be kicking booty! It's true! It seems as if people don't value and respect the elderly very much anymore. I mean, what is up with the recent violence/attacks to poor elderly folk who are walking by themselves? It's just heartless and disgusting. I've given you an award. You can pick it up at my blog! I love books that enlighten about other cultures. Plus, I think the story of two brave, resourceful, older women would bouy up some of those attributes in me. I'm so glad to see that this book has seemed to touch each of you as it did me. All of us I'm sure are around the same age, give or take ten years? ; at any rate, we're all headed toward our seventies as these women are.Now, my mother is in her seventies, and it's all I can do to keep up with her.But, we need these women to inspire us, to show us that we're not incapable or unnecessary. That's why I love this book and your comments.